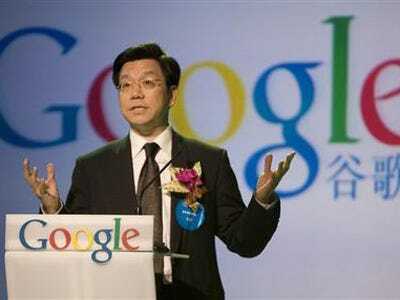 One of the most prominent names in Chinese technology, Kaifu Lee, announced this weekend that he had been banned from Weibo and Tencent for a three-day period. Columbia-educated Lee has run both Microsoft and Google’s operations in China and currently runs InnovationWorks, a startup incubator based in Shanghai. His reach in China is incredible, with 30 million followers on Weibo, which Bill Bishop of the Sinocism blog notes is “like a provincial radio or TV station”. Lee announced his ban on Twitter, where he has almost a million followers. What exactly prompted the ban? Censorship of individual posts on Weibo is a common occurrence, but a blanket ban — especially on such a high-profile individual — seems extreme. Something bad must have happened. We reached out to Lee but he declined to speculate. In a post on LinkedIn, however, he discussed his hope for Chinese social media, and mentioned a variety of controversial comments he had made on Weibo. The list includes Lee’s objection to the blockade of GitHub and his campaign against short sellers. Curiously, however, Lee does not mention the key subject which many suspect led to his ban. According to James Griffiths at the Shanghaiist, Lee had mocked Chinese search engine recently Jike, before criticising the company after rumours that it was wasting public money and laying off 100 employees (the rumours had first appeared on the Chinese tech blog Huxiu, where it had been swiftly censored). Jike, a search engine run by state newspaper People’s Daily, is a controversial topic in China, with users complaining of censored search results and confusion at the instalment of a former ping pong champion as CEO. While the company has denied any plans for layoffs, it does appear to have business problems: its market share is said to be negligible at best, with one article says it has less than 0.0001% of search users. I won’t comment on this gossip article but may I ask, why use taxpayers’ money to fund a search business? Can it be possible to do search engine business without a belief in free information flow? Why was the head of a search engine company appointed by the party? And could Google beat Yahoo to be the world’s largest search engine if the US Democratic Party appointed [Olympic champion swimmer Michael] Phelps to be the CEO of Google? China’s attempt to quiet Lee, however, appears to have had the opposite effect. Lee has gained thousands of new Twitter followers, and his name trended on Weibo for days. The tech blog that he linked to found its own way to get around censorship too, posting to a Tumblr account after the article was blocked.